Paddleboard Techniques for Beginners: Do You Have The Skill? SUP, also known as stand up paddling, has been around for less than a decade. 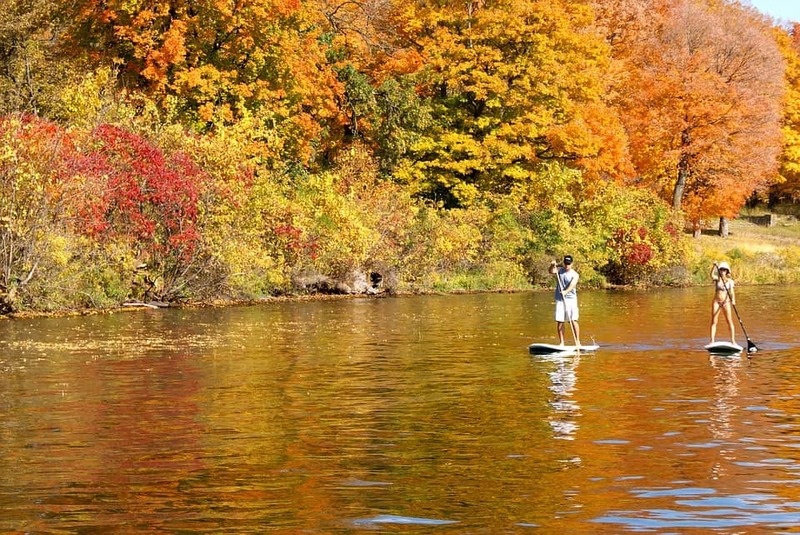 While a SUP is not yet quite as recognizable as a bike, it’s definitely getting noticed. A fast growing design and manufacturing industry have virtually sprung up around this fun, exciting, and versatile sport. These boards come available in a wide range of prices, styles, and sizes. Specific models are designed for yoga, ocean racing, long distance touring, fishing, flatwater recreation, and lake and river paddling. These boards are fueled by the paddler and they offer a tough cardio workout that can work to relieve stress and improve strength and endurance. Paddleboard techniques can vary, based on boarding style. With an easy learning curve, this type of boarding is a great choice for improving the rider’s overall fitness, but learning how to ride a SUP can take a little time and plenty of practice. We’ll cover some of the basic tips, tricks, and techniques that can have you handling and paddling your board like a pro in no time. If you’re a beginner, learning how to use your board can be a bit intimidating at first. For practice, seek out a body of water with no current, wind, or waves. The water should be deep enough to prevent you from hitting the bottom, if and when you fall. Be prepared to fall often. In fact, most pros recommend falling on purpose in order to get a better feel for getting back on a board in the water. As you earn more experience, you won’t fall as often and more places will open up to you. To start, walk into water that goes up to your knees. Rest the paddle across the board, toward the nose, about a foot above the center. Now, face forward and place one knee on each side of the board, going slowly, until both knees are straddling the handle hole. Pro Tip: The knees should remain comfortably spread, about one foot apart. Be sure to take note of where the knees are placed and adjust until you feel well balanced. You should be in a pony ride position. Now, place both hands on the paddle’s shaft, keeping the fingers spread wide with the tips of your fingers on the deck. Your hands should be placed directly in front of the knees. Next, press the tips of your fingers on the board’s deck, bringing one foot up and placing it where your knee was. The elbow on this side should be straightened to allow room. Repeat this on the other side and stand slowly from a squat position. As you stand, bring the paddle up with you. The paddle should be used for balance. Once you feel comfortable, completely straighten your back. Your knees should remain bent and your eyes should rest on the horizon. When you’re ready, inch your toes and feet to a more comfortable position. The paddle blade should then be placed in the water with the bent portion facing in a forward position. Once the paddle is in the water you should feel more stable. The paddle acts as a sort of third leg, providing more stability. 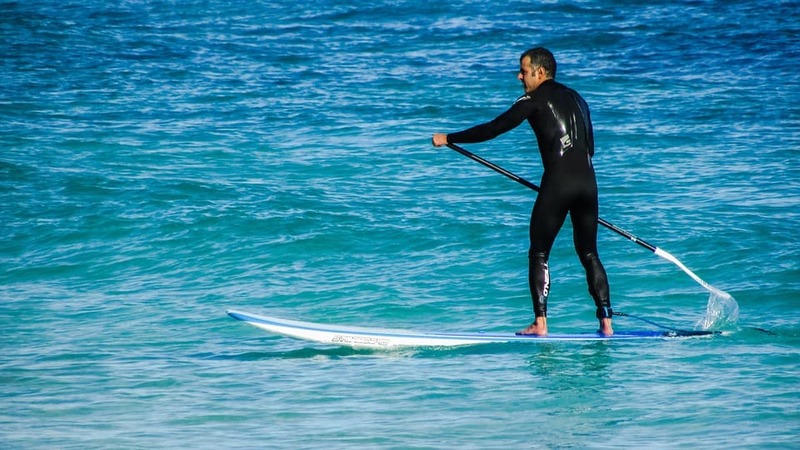 When you’re upright on your SUP, your feet should be placed shoulder width apart, with the knees bent slightly. To even out any movement on the water’s surface, the legs should be used as individual shock absorbers. Remember to keep your eyes on the horizon instead of on your feet. The shoulders and head should remain erect with the hips in line with the shoulders. Now, you’re ready to begin paddling. Keep in mind that forward momentum will increase your stability. Start off by placing one of your hands on the paddle’s grip, with the other hand placed on the shaft. Keep the arms straight. The bend in the paddle should always be pointing behind the rider. The paddle’s blade is sort of like a forward facing spoon. Now, rotate and twist from your center, while at the same time stacking the shoulders as you paddle. Your abs will help carry the load once your torso is fully engaged in the paddling. This is the type of intense core workout that avid boarders talk about. The blade should be buried until it’s totally submerged. Now, bring it toward the back, following the contour of the board and stopping at the feet. Switch sides or repeat. Remember to keep your momentum. Four or five strokes are much more efficient than a couple of extra-long strokes. When you’re learning this paddle board technique, try to keep your strokes fairly short. This can help with keeping the board going forward in a straight line. When you paddle on the right, the left hand is on top. You will need to reverse those positions when switching sides, and bring the top hand across your body. Start paddling on the left side only and you’ll notice the board will start to arc toward the right. When you paddle on the right only, the board will start to turn toward the left. If you want to reverse direction faster, paddle backward on either side of the board. More experienced riders can turn their board by lifting a foot and planting it further back on a SUP, then shifting their weight and putting pressure on the foot placed in the rear. This will lift the nose of the board out of the water. With a sweeping, deliberate stroke, the board will quickly turn. Falling off your board is part of paddleboarding. Once you fall off, you’ll be an official member of the SUP tribe. A beginner usually dreads falling. Aside from getting wet there’s little chance of you getting hurt. Make sure that the water you’re paddling around in is shoulder deep. This will ensure that you won’t hit the bottom. Try to fall to the side of the board instead of on your board. Avoid paddling too close to other riders, surfers, buoys, or boats. Falling on moving or fixed objects can lead to serious injury. If you’re a beginner, never paddle alone until you feel confident in your riding skills. Beginners should also avoid paddling in inclement weather or high wind days. Paddleboard Techniques for Beginners	Overall rating:	5	out of 5 based on 5	reviews.